Images from NASA’s New Horizons mission are showing that the surface of Pluto possesses an astonishing and unexpected geological diversity. 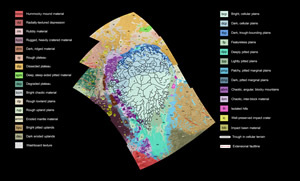 To help make sense of this complexity and to piece together how Pluto’s surface has formed and evolved over time, mission scientists construct geological maps like the one shown in this image. 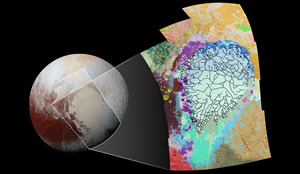 This map covers a portion of Pluto’s surface that measures 1,290 miles (2,070 kilometers) from top to bottom, and includes the vast nitrogen-ice plain informally named Sputnik Planum and surrounding terrain. As the key beside the map shows, the map is overlain with colors that represent different geological terrains. Each terrain, or unit, is defined by its texture and morphology – smooth, pitted, craggy, hummocky or ridged, for example. How well a unit can be defined depends on the resolution of the images that cover it. All of the terrain in this map has been imaged at a resolution of approximately 1,050 feet (320 meters) per pixel or better, meaning scientists can map units with relative confidence. The various blue and greenish units that fill the center of the map represent different textures seen across Sputnik Planum, from the cellular terrain in the center and north, to the smooth and pitted plains in the south. The black lines represent the troughs that mark the boundaries of cellular regions in the nitrogen ice. The purple unit represents the chaotic, blocky mountain ranges that line Sputnik’s western border, and the pink unit represents the scattered, floating hills at its eastern edge. The possible cryovolcanic feature informally named Wright Mons is mapped in red in the southern corner of the map. The rugged highlands of the informally named Cthulhu Regio is mapped in dark brown along the western edge, and is pockmarked by many large impact craters, mapped in yellow.